Need to store more bikes in the shop or at home? The bicycle tower made by Yueni is the solution to solve your storage problems. It provides enough space for four bikes and has been certified to carry one hundred kilograms. The bikes can be mounted tool free, including setting the four mounts. The Bike Tower also provides additional space to store components and accessories like wheel sets. These can be mounted with separate hooks. The Bike Tower can be installed easily and comes with an integrated level. 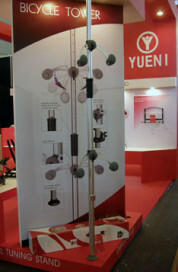 The Bike Tower packaging, including all parts, measures only 1.10 meters to make it easy to carry for transportation.